Winchester Thurston sixth graders Peter Kubiak, Otto Graham and Nick Blair work on planting one of 400 Eastern redbud trees that will soon bloom along Pittsburgh's river fronts and hillsides. “The grays and the browns of winter in Pennsylvania can really drag on people, so when you see that burst of color, that really was a big part of the inspiration,” he said. In addition, indigenous white pines and American hollies will be planted. Bergman said planting diverse species of trees and shrubs is a good way to control pests and diseases. Bergman said the redbuds seed prolifically and will serve as a food source for birds, while bees will enjoy the nectar from the blossoms. The trees will be planted on trails, hillsides, parks and open spaces along the Allegheny, Monongahela and Ohio rivers, around downtown Pittsburgh and near Point State Park. Bergman said members of the Explorers Club of Pittsburgh rappelled down the steep hillsides of Mount Washington to plant saplings over the weekend, and the conservancy will also use seed bombs to get redbud seeds onto hard to reach areas. 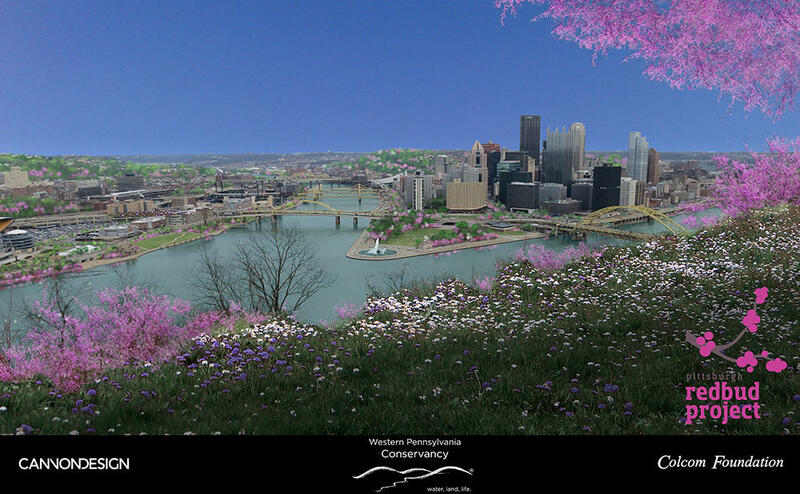 A mockup shows what Pittsburgh will look like with the Eastern redbuds in bloom. The project is being funded by the Colcom Foundation, which kicked in $520,000. John Rohe is vice president of philanthropy and said tree plantings like this one improve quality of life for residents and make the city more appealing for visitors. Students from Winchester Thurston School and employees from Duquesne Light volunteered their time to help plant saplings along the Three Rivers Heritage Trail on the North Shore Tuesday morning. Kelly Flynn has worked as a field staff member with the Western Pennsylvania Conservancy for the last three years and helped sixth graders Otto Graham, Nick Blair and Peter Kubiak dig a hole for a redbud. Blair said digging the hole was a little harder than he had anticipated, especially on the sloping hillside between Heinz Field and the trail, but Kubiak said it was better than being in math class on a sunny and warm spring day. The site of a nun retreat in Fayette County will now be protected by the Western Pennsylvania Conservancy. The Sisters of Charity recently signed an easement agreement with the conservancy, ensuring the land they have used as a retreat site for decades is preserved and doesn't become over-developed. Fallingwater in Mill Run, Pennsylvania, is one of 10 Frank Lloyd Wright buildings that has been nominated for inclusion in the United Nations Educational, Scientific, and Cultural Organization (UNESCO) World Heritage List.